Seeing Ali Edwards' Summer Manifesto prompted me to create my own. It was fun putting to paper what had been dreamily swimming around my mind. My favorite is "Look Kids in the Eye--LISTEN" I need to do that more. Such a good goal. 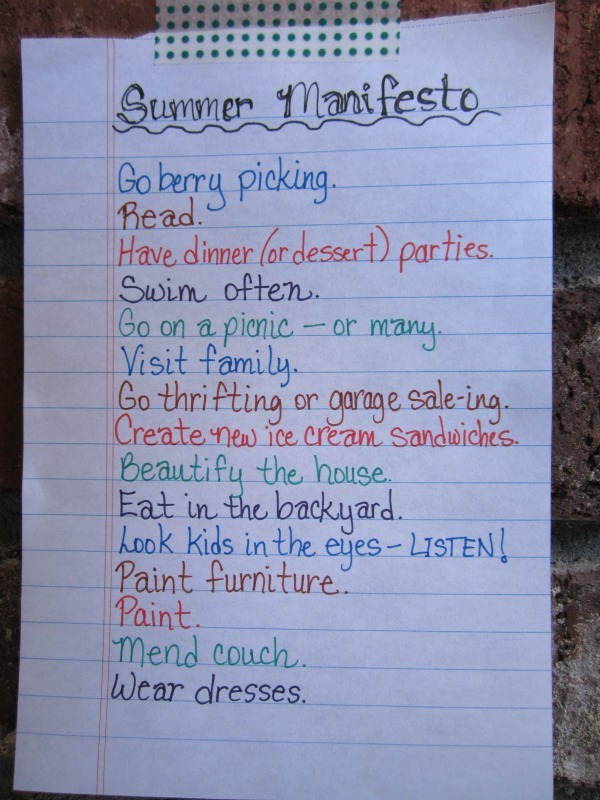 I want to write a summer manifesto, too!! But not until it's really summer here...almost 3 more weeks of school! Bleh. Three more weeks? Ugh, you poor thing. I'd love to see your manifesto when you DO write it! What a fabulous idea!! I love how colorful yours is, too!! It was really fun to think of. I've thought of about ten more to add since I made it. Gonna have to get a bigger sheet of paper! Wow, you DO have a full summer! Wishing you a break-through on the article! Oooh and exploring the countryside--I like! Hope you manage! An iced coffee helps. Sounds like an amazing plan, Shannon! Winter is one of my favorite seasons: knitted socks, chili, hot chocolate, dark days to snuggle under covers and read. Try to stay warm! I think as mothers we struggle with that because there is so much to be "doing". But the greatest moments come when I stop and really pay attention. Visiting you from Bliss Habits today! What a fun summer manifesto!!!! I love all of what you've included here. My list includes many of the same - I'd also include play with my dogs, create delicious cupcakes, create more art, see more movies and plays, and be happy! So glad you stopped by! And yum, cupcakes...may need to add that to my list. i plan to hoop more and figure out forgiveness! (a super hard skill for me :( happy summertime! Those are wonderful plans, Camille. I love hooping and should do it more. And I think forgiveness is difficult for all of us at times. I'm stopping by from Bliss Habits as well, love your post there. This is a great idea, I must do one as well, and I think mine will have to include going out with the family without mobile phones or cameras - just enjoy the moment. Oh that's a good one, Carolyn! It is hard to get disconnected from our toys sometimes, isn't it? But it's such a great thing when we do! Thanks for stopping by! I like the one about looking your kids in the eyes and listening. I'm going to have to do that this summer! :) I'm going to make myself go swimming more! Such a simple thing but one we overlook. I love swimming, it's getting into a swimsuit I despise. Haha.